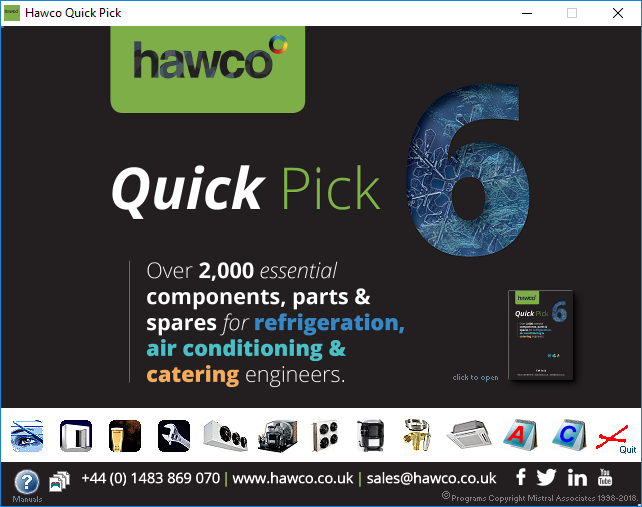 Licences to operate programs and interactive databases have been sponsored for the exclusive use of Refrigeration & Air Conditioning contractors Who are either existing or intending customers of Hawco Ltd and who are located in the United Kingdom or the Republic of Ireland. Please complete the form below with your name & email address, answering the few simple questions we respectfully ask to help us provide you with the best possible service and optionally writing any additional comments in the box provided. Click the Submit button at the bottom of this page to send the data. After successful data transmission you should be automatically taken to a page displaying your program and database download options. The information you provide on this form will not be divulged to any third party or stored in any data retrieval system for longer than it takes for us to deal with your request or to answer any questions. When installing the software a valid Registration Code must be entered in order to gain access. This will be sent to the email address that you provide below as soon as possible after completion of your download and usually within 24 hours. If you have not received your code within 24 hours do not attempt to download the files again before this amount of time has expired as this will almost certainly result in further delays. No responsibility can be accepted for email transmission failures. Will your Spam interceptor prevent you from receiving codes? Access Registration Codes contain 'alpha-numeric' text. This might cause over aggressive or inexpertly set Spam interceptors to block and thus prevent you from receiving emails that contain your essential code. No responsibility can be accepted for email blocking. We are existing customers of Hawco Ltd.
We are intending customers of Hawco Ltd. This is the first time I have downloaded this software. I have downloaded this software in previous year(s). Q. 4 Required I confirm that I am aware the access code that I receive in the next 24 hours can only be used to activate one, single installation and also that the code can only be used to install the programs contained in the file I am about to download. Q. 5 Required I accept I must ignore Microsoft's libellous & false download & install warnings if I wish to use this guaranteed safe software and I am aware full details may be read by clicking the Help button in the Setup procedure prior to installing. To help us improve our programs and service we welcome your comments below. © Webmaster Mistral Associates. http://www.mistralassociates.com.